Peace Out to you Peace Sign Lovers! This is a double layered bow that has a 2.25" shocking pink grosgrain on the bottom. The top is a rainbow colored 1.5" grosgrain ribbon that has white shimmering peace signs. The ribbon changes color from purple to pink to blue to green to yellow and then to orange. 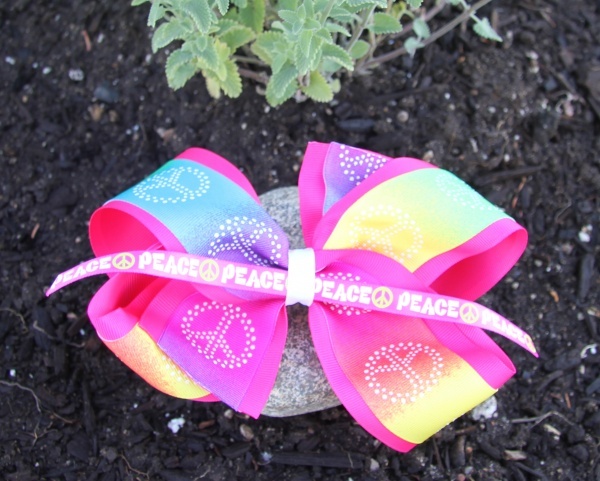 The middle has a pink 3/8" satin ribbon that has the words PEACE in white and then peace signs in lime green that runs through the center of the bow. Peace Out!